Program dismissal triggers dismissal from the UGA Graduate School. The student will be prevented from enrollment in future terms. Dismissal by a program may be appealed to the dean of the Graduate School after all avenues of appeal have been exhausted at the school or college level. This should be completed within 30 calendar days of the decision at the previous level. Students with a cumulative graduate course average below 3.0 for two consecutive terms are placed on academic probation by the Graduate School. They then must make a 3.0 or higher semester graduate average each succeeding semester that their overall cumulative graduate average is below 3.0. These students are no longer on probation when their cumulative graduate average is 3.0 or above. If they make below a 3.0 semester graduate average while on probation, they are dismissed. When students repeat a graduate course, the last grade will be utilized to calculate the cumulative graduate average that is used for probation, dismissal, admission to candidacy and graduation. Grades of S, U, I, and V will not be used in calculating the cumulative graduate average. However, when a grade of I converts to F, this may result in an action of probation or dismissal for the semester in which the conversion takes place, even if the student is not registered for the semester in which it converted. When students are dismissed under the terms of this policy, they may not apply for admission to another graduate program offered by the University. Students who are dismissed by the Graduate School for academic reasons may appeal the dismissal to the dean of the Graduate School. The appeal must be submitted to the dean within 30 calendar days following receipt of notice of dismissal. Information concerning the appeal process may be obtained in the Graduate School. 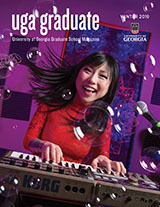 Please contact gradassociatedean@uga.edu for more information.